Highlighting continued innovation and increased performance in the SCSI storage interface protocol, the SCSI Trade Association (STA) unveiled its latest SAS technology roadmaps at the fifteenth annual Storage Visions Conference in Las Vegas. 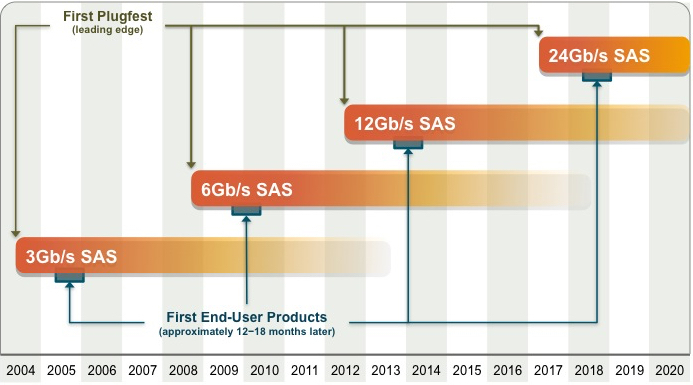 Showing the availability of prototypes and end-user products for each generation of SAS, the roadmaps include a schedule for the next generation 24Gb SAS, SAS external and internal cabling solutions and a look at SAS device-to-mid-plane interconnects. During a presentation at Storage Visions, attendees were provided with an overview of 24Gb SAS objectives that double the bandwidth of 12Gb SAS, support two generations of backward compatibility and preserve the existing SAS value proposition. 24Gb SAS commercial devices are expected in the marketplace in 2018. The demand for digital data creation and consumption is growing every year and this growth in content capacity requires not just more storage devices but faster interfaces to move that data around to where it is needed. The SCSI Trade Association is showing further innovations in the SAS storage interface that will support the growth in enterprise storage applications.